You are currently browsing the tag archive for the ‘Strathroy’ tag. 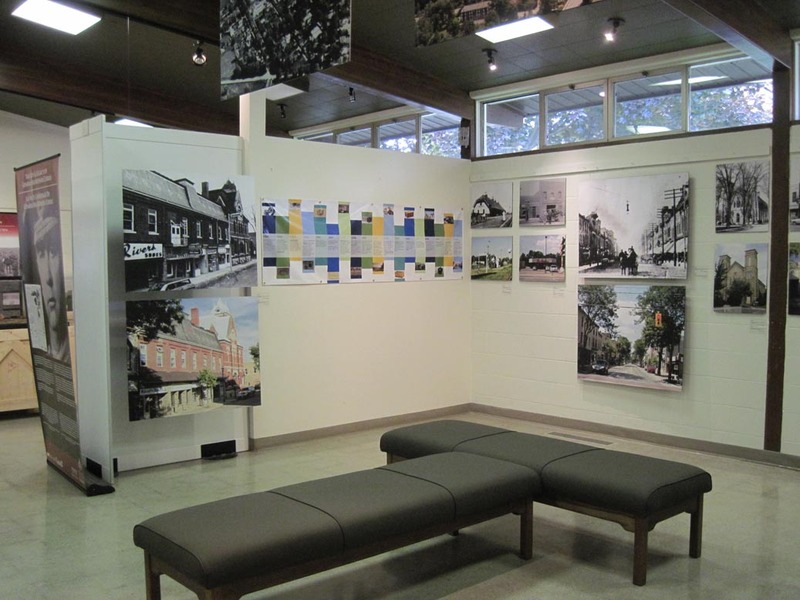 On July 30th Museum Strathroy-Caradoc opened a new exhibit titled “Strathroy-Caradoc Then and Now: A Photographic History. 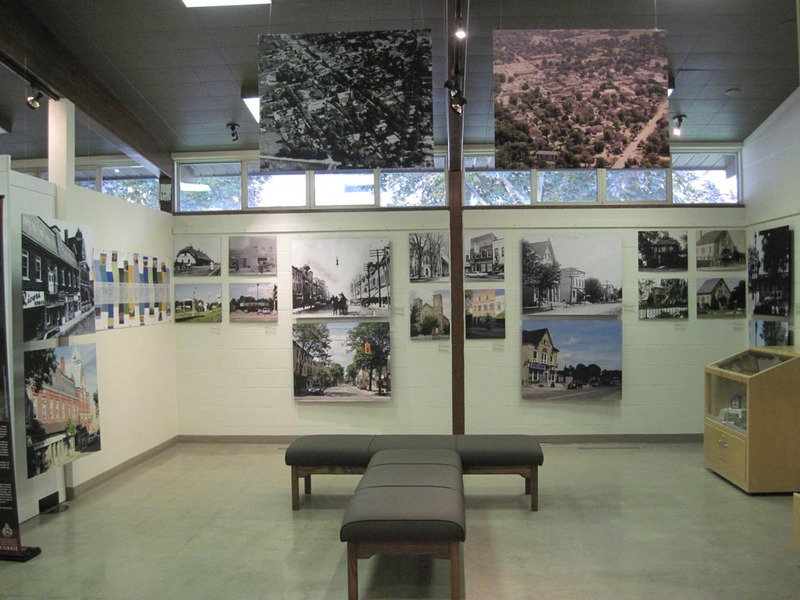 This exhibit consists of over 30 past and present images of Strathroy, Mount Brydges and Melbourne. As part of this exhibit we are showcasing cameras that are in the museum collection and telling the history of photography. 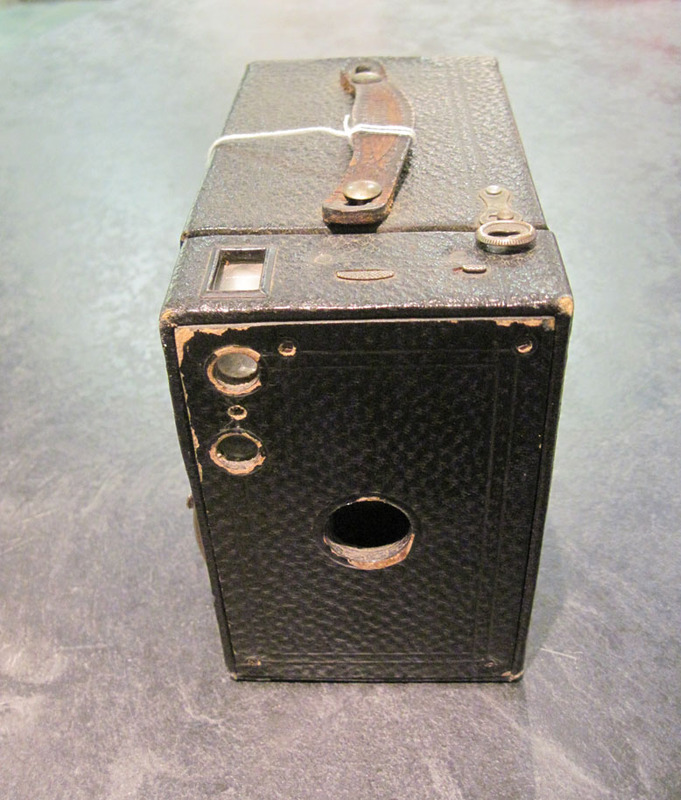 The earliest camera on display dates back to the 1920s and it is a Kodak Brownie No 2A Model B. These cameras were produced by the Eastman Kodak Company in the Rochester New York and the Canadian Kodak Company in Toronto. 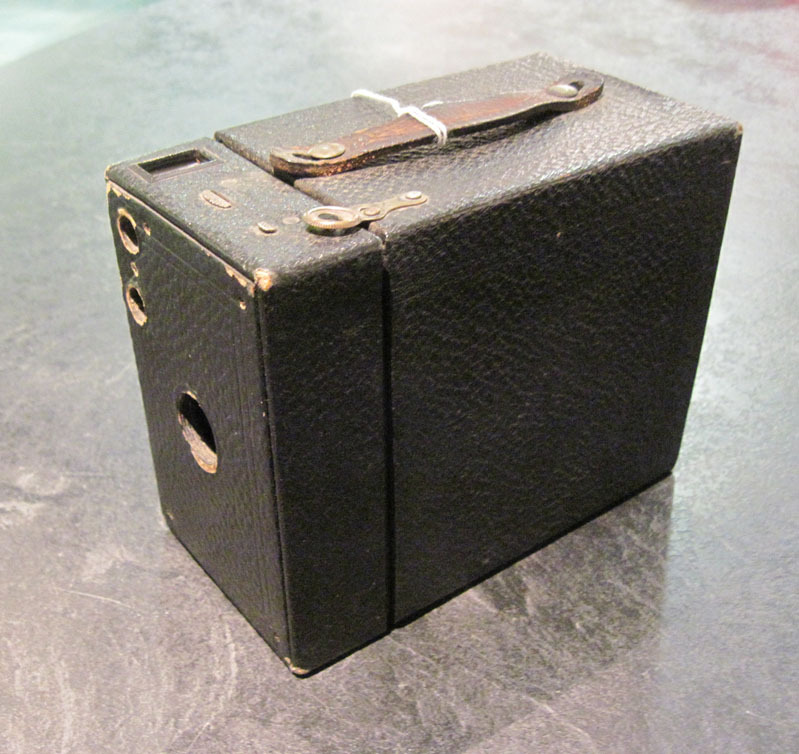 The name Brownie came about from a comic produced by Palmer Cox who wrote numberous books with these characters These cameras had a leatherette covered card box that would slide off the metal piece for loading. 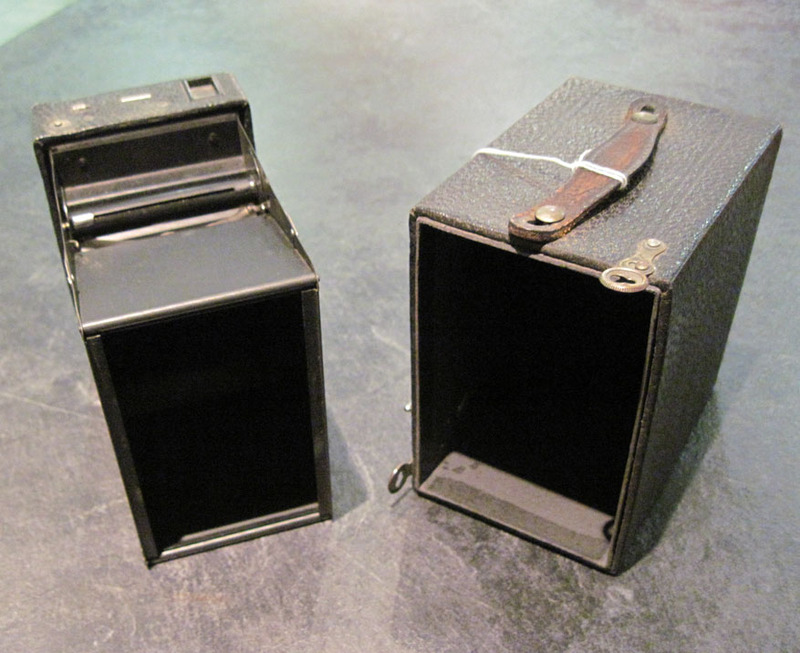 These cameras would use 116 film size and produce images that were 6.5 cm x 10.5 cm (2 1/2 x 4 1/4 inches) in size. These cameras were inexpensive and easy to use making it an ideal purchase for the average person. This month we will be looking at a spinning wheel in our collection that is currently on display in the Quilts and Coverlets exhibit. The Solomon Dell Lever Spinning Wheel was invented by a gentleman who was one of Strathroy’s original 14 settlers and one of the town’s greatest inventor. Coming to area in 1837, he opened a tavern and a house of entertainment, and tinkered with machinery to improve farming implements. The story goes that he walked all the way to the Crown Law Department of Upper Canadian in Ottawa to get his wheel patented in 1867. The patent stated it was for “a new and useful lever spinning wheel, not known or used in this province by others before [my] discovery [of it].” Dell’s spinning wheel differed from other wheels because he added a treadle, spinners could either stand or sit to control the yarn tension with their feet, rather than walking back and forth. During this time in early Canadian history settlers had to be self-sufficient and many houses had a spinning wheel. At the Provincial Exhibition held at Kingston in September 1867 he won under the category of Agricultural Tools and Implements chiefly for hand use for his invention. Another patent that Solomon submitted to the government was for an improvement in hand drills that you can see on the Library and Archives Canada website. On this website you will find patents from 1869-1919 and if you type in Strathroy there are 98 results, everything from improvements to a snow gate to refrigerators and bolt-cutters. There is one Mount Brydges result, a fanning mill shoe and two for Melbourne; a device for restraining vicious animals and a wheel. Next month we look at a quilt that was produced on a Jacquard Loom. A new feature for the Collection’s Blog in 2014 will be Artifact of the Month. With the frigid temperatures outside I thought that the perfect artifact for January would be a thermometer. This thermometer ca. 1930s is from the Gill Grocery Store in Strathroy and was used for advertisement purposes. Advertising thermometers first appeared in the 1900s and were widespread by the 1920s. Intended to be hung outside, the earliest were made of metal like this one. They were made by many different companies including beverage, food, automotive, and agricultural firms. Thermometers from Coca Cola and Pepsi are collector’s items today. Note on this thermometer the scenic image; many times there were added images that did not relate to the company. Also note that the thermostat’s measurements are in Fahrenheit, it wasn’t until 1975 that Canada converted to the metric system. The Gill Family name is associated with early businesses in Strathroy. 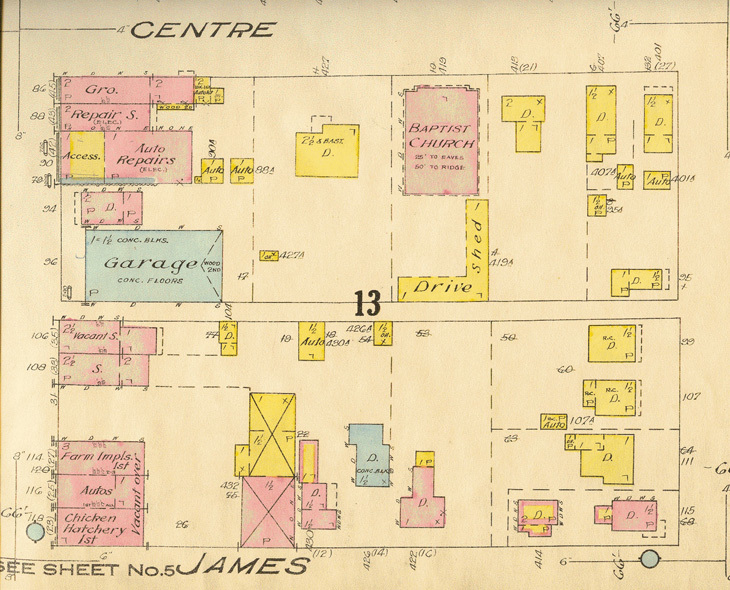 Business included; Mihell and Gill Store, Gill Bros. Groceries and Provisions and C. W. Gill Independent Grocer. 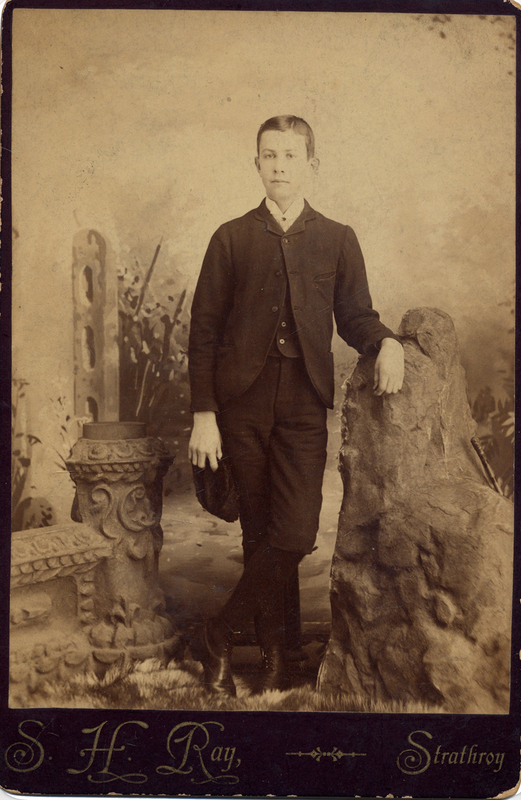 Charles Wesley Gill was born on October 12th 1887 in Strathroy. He was the son of Aaron Gill, who immigrated to Canada in 1855 and was a butcher and Sarah Jane Grills. In the 1911 census it notes that he is a salesman for a grocery and he is living at home with his parents. His brother Frederick was also in the grocery business until he became sick and eventually died in 1922. In 1914 a year after both his parents passed away he married Wynifred Bowely, daughter of James Bowely of Strathroy. Charles W. Gill was one of the town’s few independent grocers, having two stores located on the corner of Frank and Centre Street, and Caradoc and English Street. He would sell bacon for twenty-seven cents per pound and one hundred pounds of sugar for five or six dollars. Some of the items he sold, such as flour or sugar would be found in barrels which you would ask the clerk to scoop out of. Cheese would come in blocks which the clerk would cut up and weigh for the customer. Egg grading was generally incorporated in the function of grocery stores. In 1943 C. W. Gill’s store on Caradoc Street was a licenced Egg Grading Station. Mr. Gill maintained his stores until closing up in the early 1950’s. C. W. Gill died on July 3, 1955 and is buried at Strathroy Municipal Cemetery. What do artifacts say about a man? When Ross was born in 1920 the Lyceum in Strathroy was showing Charlie Chaplin in “The Count”, and Rapley and Ballantyne Druggists were advertising Preserves and Pickles. Ross grew up in a large family that lived on Railway Avenue. His father worked at Tantons Undertaker and Furniture Store on Front Street where he was an upholsterer by trade. Ross attended Maitland Street Public School and judging by the photo below was one of the tallest boys in the class. When Ross was only 16 he left school to support his family as his father had passed way a few years prior. He started working at the Middlesex Furniture Factory in 1936 and continued there until the outbreak of war. He joined the Royal Canadian Navy on May 20, 1942. During the war he was part of the crew of the HMCS Huron. Here you see a number of items from this time. The boots were purchased in 1943 in England. In each boot, on the strap, “K. R. Smith” is written. Ross sewed his name into the Navy blanket using a “housewife” kit his mother sent him. During his service in the Navy he started to court a “local girl” who was in the W. R. C. N. S. (Women’s Royal Canadian Naval Service) also known as the Wrens. By the end of the war this division of the Navy had 39 trades open to women. Job categories included steward, plotter, sick berth attendant and coder. Ross and Doris dated throughout the war and even found time in Halifax in 1944 to “go out on the town”. Ross returned home in 1945 and was discharged on October 2nd of that same year. He received a Public Recognition Certificate from the Town, thanking him for serving in World War II. Doris and Ross married on June 14 1947 and settled down on Saulsbury Street to start their family. Doris continued her work as a telephone operator and Ross went back to the Middlesex Furniture Factory. In 1950 a group panoramic photo was taken of the staff of the factory, here you see Ross in the second row from the bottom, 7th from the right. He continued at the factory until 1982 when he retired. On his down time Ross liked to collect model trains, do yard work, and garden. Looking through the local newspaper, the Strathroy Age Dispatch, we come across Ross showing off an amaryllis plant that had six blooms in February 1972. Ross was also a regular member of the St. Andrew’s Presbyterian Church in Strathroy, and below you will see a photo from the 1988 Church Yearbook. Finally there is one more photo, and this is how I will remember Ross, standing in his uniform with all of his WWII medals. Cleaning the Negatives: 10 down, 2990 + to go! Rinsing the glass plate negatives in distilled water. 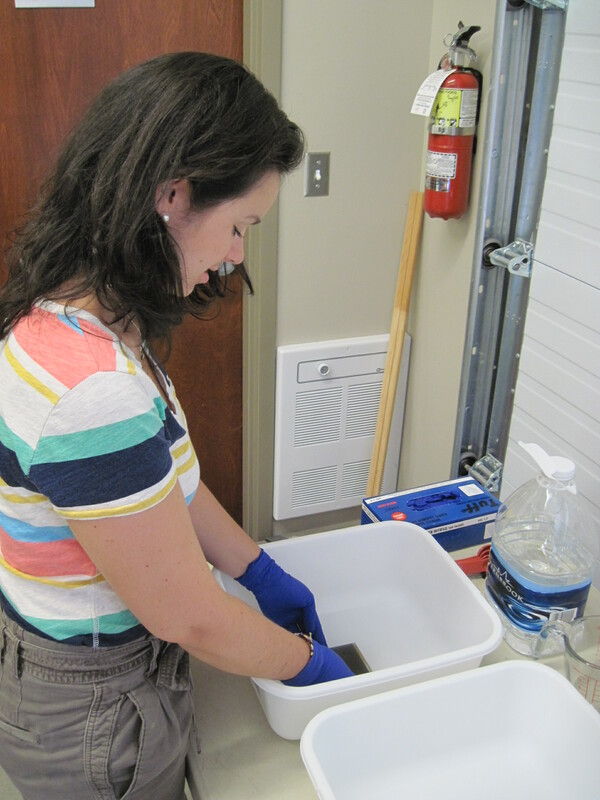 This past Friday, our Collections Assistant Crystal and our summer Intern Jordan started the long process of deep-cleaning the 3000 + glass plate negatives associated with the R.S. Williams Negative Collection. We started with a trial of ten negatives, making sure to test a wide variety in case smudging occured or the emulsion started to flake. The negatives were put into three different baths, being soaked for 10-15 seconds in each. Gloves were worn to prevent finger prints and other natural oils from getting on the negatives. The drying process was the most time consuming, taking over 8 hours. Due to the long drying time, we will only be able to fully clean and package approximately 20 negatives per day due to lack of space in our drying racks. Some of the negatives had what looks like red marker on the top, identifying who was in the picture. The writing was monitored carefully as the negatives were soaked as to prevent fading and loss of information. The description of each negative was taken, including a photograph before being treated with the wet cleaning process. These descriptions will help to form a preliminary index for the collection. All ten trial negatives drying. Here at Museum Strathroy-Caradoc we have had a very busy summer so far even though it seems like it just started! We are working on two projects right now that have created much interest in the community. Sir Arthur Currie Project: As some of you already know, we were awarded a grant from the federal government in order to fund the creation of a travelling exhibit about one of Strathroy’s most famous natives, General Sir Arthur Currie. This exhibit will highlight Currie’s life as he lived it in Strathroy, his efforts in World War One and his life in Montreal. We are currently working with our partners to create a semblance of a “creeping barrage,” one of the military tactics for which Currie was reknowned. A creeping barrage is an artillary barrage that slowly “creeps” up the field of battle towards the enemy lines. The primary usage of the creeping barrage is to create cover for the soon-to-be advancing soldiers rather then kill enemy troops. For a history of how the creeping barrage was used, click here! R.S. Williams Collection: As mentioned previously in a blog posting in November, the R.S. Williams Collection was discovered above a local business in Strathroy, ON. Since its discovery, we have received $1000 from the provincial government in order to help clean and properly store the negatives. 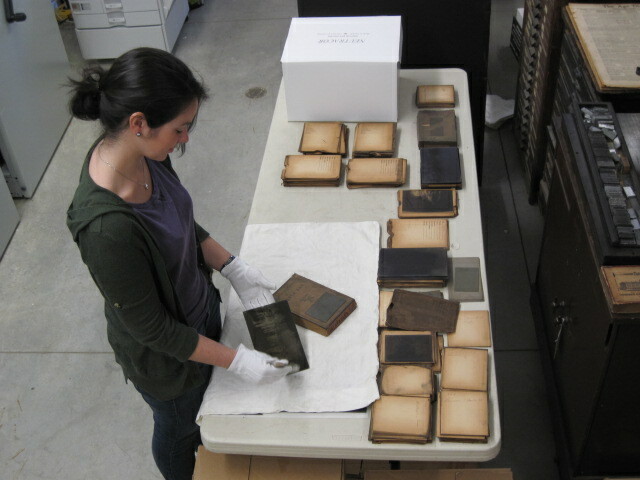 Using guides from the Canadian Conservation Institute, we will be cleaning and storing the first 1000 negatives. Varying in size, these negatives will be cleaned using a 4-step process. Using three wash tubs, the neagtives will be placed in three different solutions: distilled water, distilled water and ethanol, and distilled water and PhotoFlo. The distilled water is used so that minerals from regular do not damage the emulsion on the glass. The ethanol helps to remove any dirt or grime that has affixed itself to the emulsion and/or glass over the years. Finally, the PhotoFlo helps to prevent streaking. 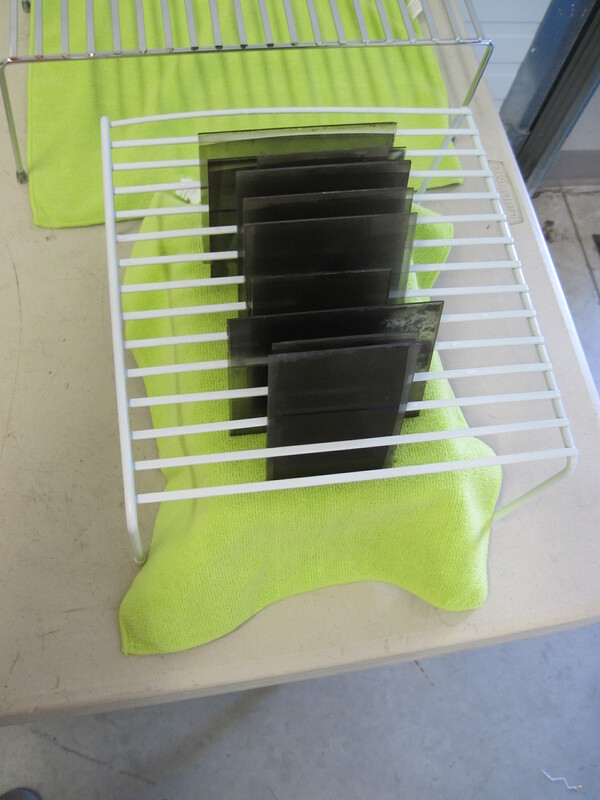 Once the negatives have been treated in all three formulas, they are placed vertically in a drying rack, being careful to lean only the glass side of the negative against the rack. This whole process will take about 8 1/2 hours per negative. February is Black History Month and today I would like to highlight Henry Ward Beecher Parker, better known as Dixie Parker. Henry Parker is noted as a “labourer” on the 1871 and 1881 census records for the town of Strathroy, and lived with his wife, Mary Ann Parker, and his children William, Frank, Mary, Sarah, Alice and Florence. Both Henry and Mary Ann were born in the United States, but the exact date of their arrival in Canada is unknown. The letters of Stewart Lamont indicate that Henry Parker was at one point the manager of the St. Lawrence Bank in Strathroy, and that he briefly moved to Chatham in the mid-1880s to work for a construction gang with the Canada Pacific Railway. An obituary for Mary Ann Parker was published in July of 1887; the 1891 census notes that Henry is widowed. Death of Mr. Henry Parker. On Friday last the death of this well-known and useful citizen occurred at his late residence, after a short illness from kidney trouble, his age being stated at 65 years. “Dixie,” as he was familiarly styled, was an exceedingly handy man around town, and for the past thirty years or so has filled a place among our citizens that will cause his taking away to be very much felt. He was born in Virginia a slave, and at the breaking out of the American war sought refuge in Canada, taking up his residence here, where he has remained almost continuously ever since. Many indeed will miss him, and many of our old citizens in other places will regret to hear of his demise. The funeral took place on Sunday afternoon, Rev. Mr. Newton conducted the services, and a very large gathering of our townspeople being in attendance. 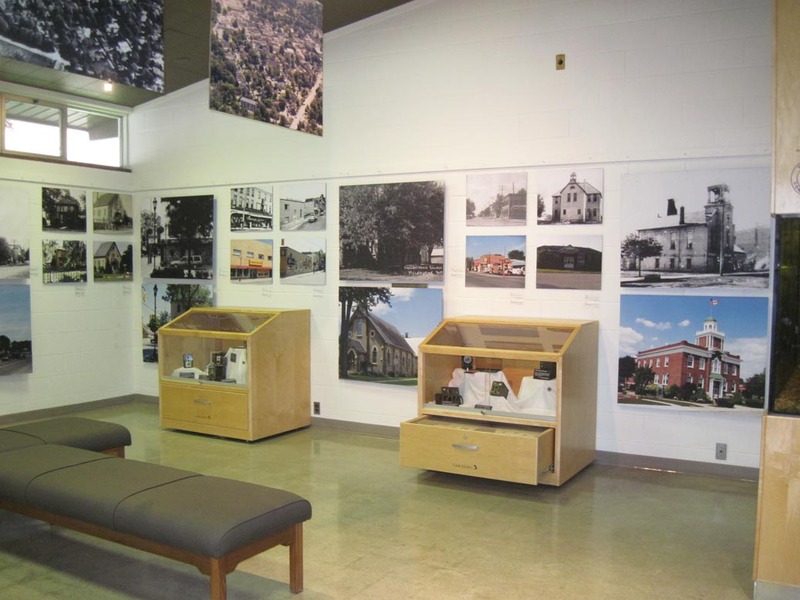 The above information was gathered by Brianna Hammer for exhibit development to supplement a travelling exhibit “Passages to Freedom” that was shown at Museum Strathroy-Caradoc in 2010. A photography studio dating back to 1900 was discovered in the third-floor attic space above Bossons Pharmacy in Strathroy late last year, leading to an incredible donation to Museum Strathroy-Caradoc. 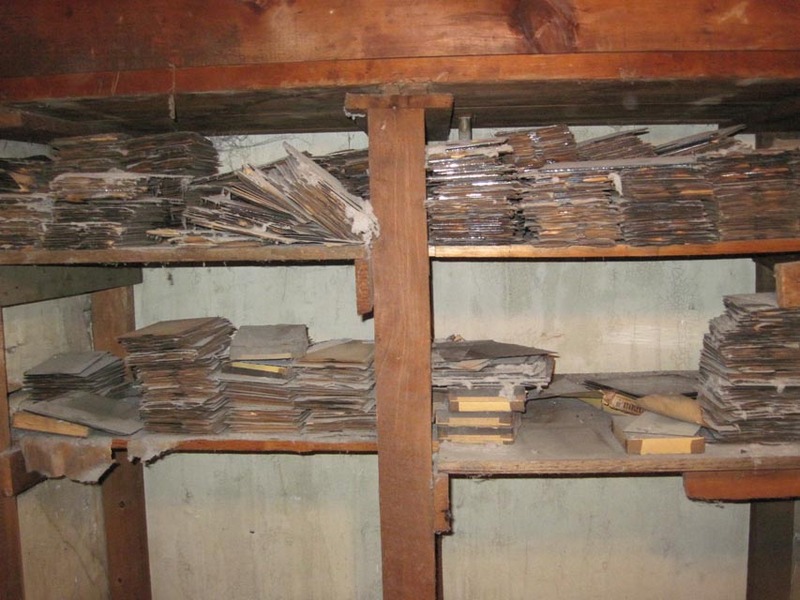 Through the efforts of Louis Haan the contractor who discovered this treasure and building owner Laura Bossons nearly 3,000 glass-plate negatives have been saved ensuring an important piece of history is shared with the community. The photography studio, run by Roger Sifton Williams, was in operation from 1900 until 1905 above Stepler’s Drug Store on Front Street (present-day Bossons Pharmacy). Williams was born in Strathroy in 1877 and, according to the 1901 Census, lived on Front Street with his wife Marion Maud Lucas. During his short career as a photographer in Strathroy, R. S. Williams captured images of local residents and outdoor scenes. Many of the photo negatives are identified, making them valuable for genealogical and local history research. Next steps include organizing, cleaning, cataloguing and storing these treasures so they are accessible to the public. The estimated cost of the project is $5,000, which includes the purchase of cleaning supplies and archival envelopes. A later phase of the project will include digitally reproducing the images so they are available to the public. If you are interested in helping preserve these photographs for future generations please consider donating to Museum Strathroy-Caradoc and specify that you’d like the money to go toward the R. S. Williams Collection. All funds raised will go directly to purchasing supplies to clean and store the glass-plate negatives. With the provincial push for municipal amalgamations in the late 1990s, the town of Strathroy turned to its neighbour, Caradoc Township. The Municipality of Strathroy-Caradoc was created in 2001, joining the Corporation of the Town of Strathroy and its approximately 12,000 residents (Ward I) with the Township of Caradoc and its 7,000 residents (Ward II). The first Council of the Municipality of Strathroy-Caradoc in 2001 was composed of John Brennan, Doreen Gysbers, Peter Aarts, Shirley Cleve, Brad Richards, Jim Pardy, Steve Dausett, Mayor Mel Veale, and Steve Pelkman. This merger formalized a unique relationship that had already existed between the rural community and its commercial centre – one that has fostered our development as an amalgamated community and inspired the slogan of ‘urban opportunity’ and ‘rural hospitality’ for Strathroy-Caradoc. Along with the slogan was the design of a new logo. Both communities had previous crests and the design of the new logo was a step away from these crests. The design that was chosen would be used on letterhead, pins, business cards and other decals including the new flag. 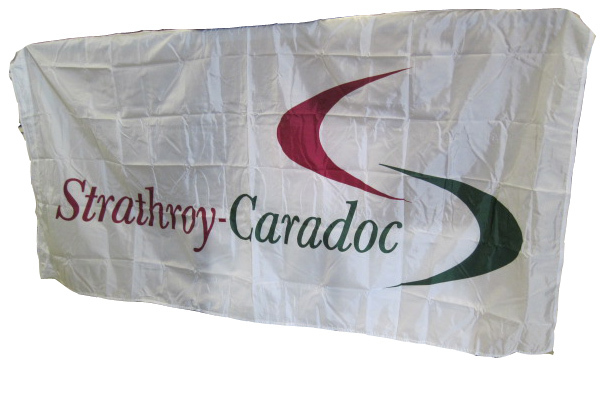 It had two swooshes in red and green around the words Strathroy-Caradoc. The use of a swoosh is very popular and can be found in a number of different company logos. As you may know, this is not the current logo for the Municipality. The first design lasted for about 5 years when a new design with a more historic meaning was chosen and is now our present logo. May 24th 1998 was a sad day for downtown Strathroy. Fire completely destroyed four businesses located from 61-67 Front Street W est as well as displaced a number of people who lived above. Beacon Books, Lambert Flowers and Gifts, Dr. Ron Kreuzer, optometrist, and New Dawn Furniture and Auction house were completely destroyed. The Pet Stop, and Bi-way were also damaged by the fire. Firefighters from Adelaide-Metcalfe, London and Caradoc assisted the local department to help contain the fire. Damage was estimated at over 1 million dollars. In the weeks that followed the community rallied together with an outpouring of support to those who lost everything in the fire. Letters in the paper were published by all of the business owners thanking everyone for their support. With the community’s support most of the business owners were able to open in other locations within weeks. The location has been turned into a parkette where downtown shoppers can take a minute to relax. Out of the rubble P. Beaton decided to take bricks from each building and recreate the facade of each business. Each of these bricks were carved with a dremel tool using various cutting and grinding bits. They took between 20 and 30 hours each to complete, and were completed in November 1998. After spending over 100 years as part of four buildings, these four bricks have become pieces of art, depicting the fronts of the buildings that they were an actual part of. Currently the museum is looking for information on P. Beaton and images of the fire. If anyone has information please contact Museum Strathroy-Caradoc at 519-245-0492. Museum Strathroy-Caradoc opened to the public in 1972. 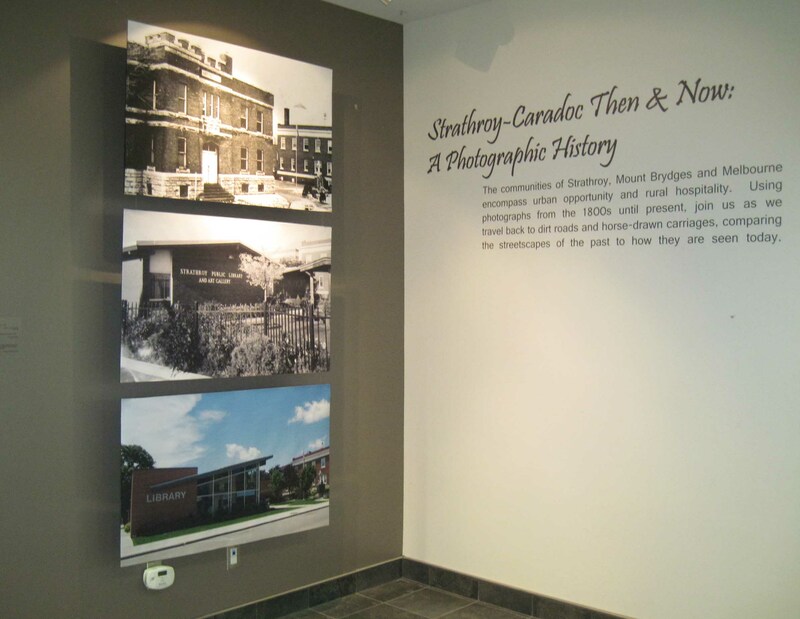 As a community museum we strive to preserve and tell the story of Strathroy-Caradoc, and inspire residents to explore and understand the community around them.